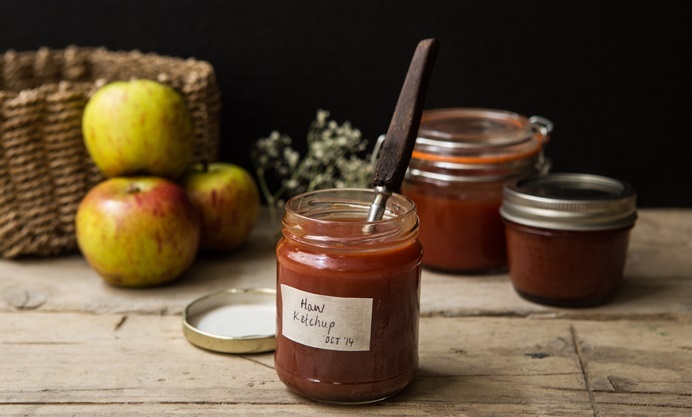 This hawthorn berry ketchup recipe shows off the best of what autumn has to offer. With a sweet and sour flavour and rich red colour, this sauce is great served with richer meats like venison or pork belly. I, along with the rest of Britain, seem to have caught the foraging bug. It’s autumn, after all, prime foraging season, and suddenly everyone’s making blackberry crumble, crab apple jelly and wild mushroom risotto. There was once a time when I couldn’t walk by a bramble bush without picking a few handfuls of berries. Now I’m getting a little bored. There’s a reason why I’ve been put off hawthorn berries for so long: they’re not exactly straightforward to forage. Haws should be picked late in the season (October and November are ideal), when they are as ripe as possible. Although hawthorn berries come off the tree easily, they often bring with them lots of stems which should be removed before cooking – a slightly time consuming process. On their own, haw berries aren’t anything exciting – they’re mostly pip and taste a bit like a dry, under ripe apple. They really need to be cooked to get anything useful out of them. 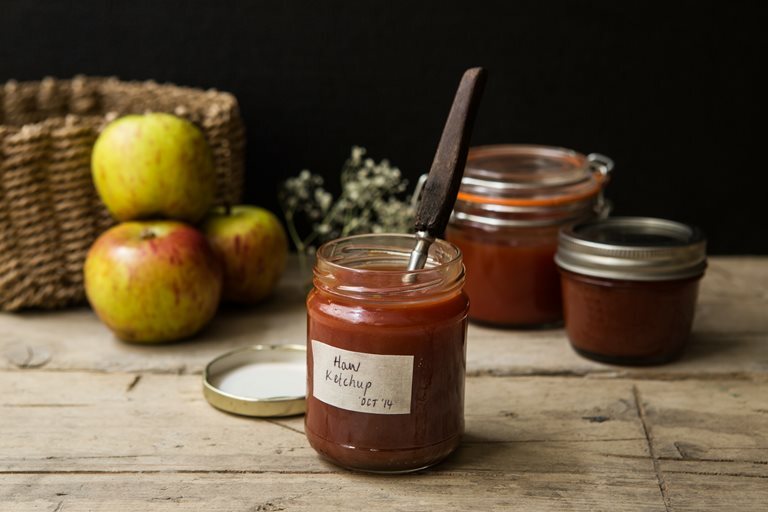 So for my first haw trick, I decided to whip up a version of the haw ketchup in Pam Corbin’s preserves book, also popularized by Hugh Fearnley-Whittingstall, who dubbed it haw-sin sauce on River Cottage. The result, well, I can’t say it bears any resemblance to the Chinese hoisin dipping sauce for which Hugh calls it, but it’s a nice sweet and sour sauce with a little bit of a spicy kick thanks to lots of black pepper. And you can’t beat the colour: a deep ruby red reminiscent of the berries themselves. When all was said and done, I felt pretty good about putting these over-abundant but oft overlooked haw berries to good use in a recipe that wasn’t yet another hedgerow jelly or jam. Pam Corbin reckons the haw ketchup would work well with rich meats like venison and pork belly. I plan to serve mine with my Thanksgiving veggie roast later this month.